Do you ever get confused with all the different products when you go to the grocery store? Or do you go in with an idea of what you want, but leave with bags and no clue about what you are going to have for dinner? There are so many food labels and health claims that it makes it hard to decide which food is best for you and your family. One day someone tells you to eat food low in fat, and then the next day they tell you it depends on the type of fat. There are a lot of people out there trying their best to sort through the aisles of the grocery store only to leave with one bag full of groceries and an empty wallet. It can be frustrating and tends to result in bland dinner menus, repeats, or forgetting about cooking at all and stopping for “fast” food. If you are one of these people, then this free program might be for you. This class is a five-week program at the N.C. Cooperative Extension of Jackson County office starting on November 20, 2018, from 5:30-7:00 p.m. This program will be every Tuesday with the last Tuesday being December 18. During the five weeks, participants will learn truths and myths about healthy eating, resources available to help stretch their dollar, how to read a food label, how to plan meals and make grocery lists, how to navigate the grocery store effectively and efficiently, food safety information and more! The last class will end by making a holiday menu and shopping list so participants are a step ahead for the Holidays. The class will be led by the new Family and Consumer Sciences (FCS) Agent, Emily McClure, who is also a Registered Dietitian (RD). Each week we will focus on a new topic that relates to the week before. Eating healthy does not have to be expensive and participants will learn tips and tricks for keeping the grocery bill down and the stomach full. This program is not about dieting or weight loss. It is a way to learn how to eat better and become more educated about choices made at the grocery store. The idea is to learn how to make a plan, map it out, and stick to it. Learning how to manage a grocery budget helps alleviate some of the stress of cooking and provides more time to be home with loved ones. The classes are for all ages and are free. Families are welcome to come. Healthy and delicious refreshments will be served at all meetings. We look forward to seeing you at the N.C. 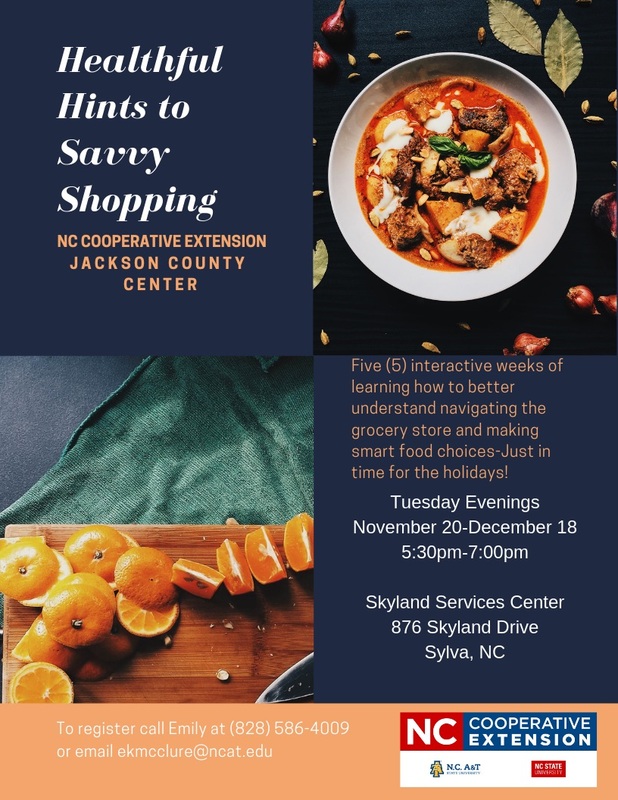 Cooperative Extension of Jackson County for Healthful Hints to Savvy Shopping. To register or for questions about the program contact the office at (828) 586-4009 or you can email ekmcclure@ncat.edu. • Should I Buy Organic?